Cardiff City manager Ole Gunnar Solskjaer has vowed his team will improve as they return to action after the international break. 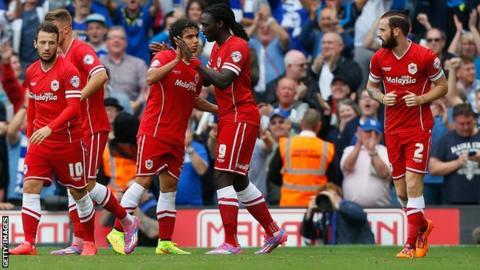 The Bluebirds welcome Norwich City to the Cardiff City Stadium on Saturday. With the transfer window now closed and the Norwegian happy with his squad, Solskjaer is looking for a big improvement. "Now we just have to gel and improve our performances because we have not been good enough," he said. Cardiff have lost just one game so far this season and lie ninth in the table with eight points from five games. "If you look at the points tally, it's ok, it's decent," said the former Manchester United striker. "But we have not been as good as I was hoping to see my team but we will get better and better; we will improve, definitely." Cardiff's last outing before the break was a 1-1 draw at Fulham and only once this season have they scored more than one goal in a league game which came when they beat Huddersfield Town 3-1 at home in mid-August. "It always happens with my teams, I don't know if there is something wrong with my pre-seasons probably," said Solskjaer. "But to be fair, at Manchester United as well, it was the way we've always just got better and better throughout the season so I'm sure we will be." New £5m defender Bruno Ecuele Manga will be assessed in training before Solskjaer decides whether he is ready for a debut, having returned from international action with Gabon on Wednesday night.